Outside my window there is a duvet cover of white snow spread over the lawn. The temperature is uncertain at this point, but my observance of plumage fluffed to maintain body heat of the birds who are enjoying their breakfast at my feeders indicates that it is somewhere between frigid and f’ing cold. For this reason, people in my neck of the woods might tell me where to put my request while some of you may find it to be a glorious reason to stroll on the beach buffeted by balmy breezes. Either way, I am going to do it and assure you that if you do too, you will have something that will not only remind you of the experience, but will enhance your indoor living space in a way that only bringing something into it from the outside can. I have all kinds of things that I have collected over the years that hold the energy of their place of origin and have blended very well. Representatives of the elements help to balance your living space and keep it and you grounded. Having them available for touch is especially nice when going outside to handle them in their environment might not be enjoyable. The bundle of vines in the urn was given to me by a Sister of my Coven and has graced my home for a long time. 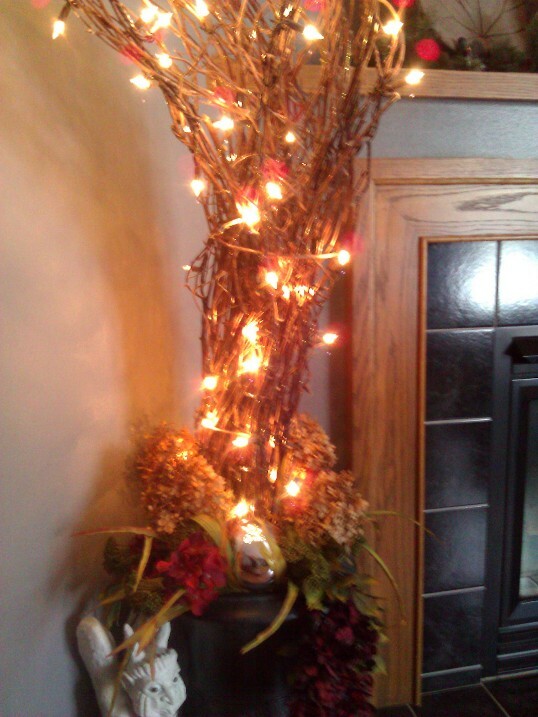 I have given them a make-over at times by changing the silk foliage and the lights need replacing from time to time, but they still add their Magick by providing me with a ‘tree’. Having something from Nature to share its beauty in an unexpected place to have it is wonderful. The energy of the soil from which they grew is felt as well as the vines themselves that curve gracefully as a ‘hair do’ that may have been styled by the wind. So, out I go when I notice that my hydrangea blossoms are a lovely shade of Autumn bronze. They are still perfectly formed though shaking in the arctic blast. Brrrr. I took a pruner with me, but it wasn’t needed when I discovered that the stems were brittle and snapped off easily. I brought them in and added them to the base of vines in the urn. Wow. They have added so much that I can’t imagine why I hadn’t filled that space between the silken wisteria and chartreuse spikey foliage before. A small silver gazing ball that had found itself homeless after the floor update is now nestled in a spot that reflects the hydrangeas. From Spring until now they have found a way to bring me pleasure and will continue to do so. When they were lime colored and sweetly scented in Summer I didn’t want to bring them in since the plant is fairly new and blossoms were sparse. The ones that remain out there provide a perch for the birds and help shelter them. 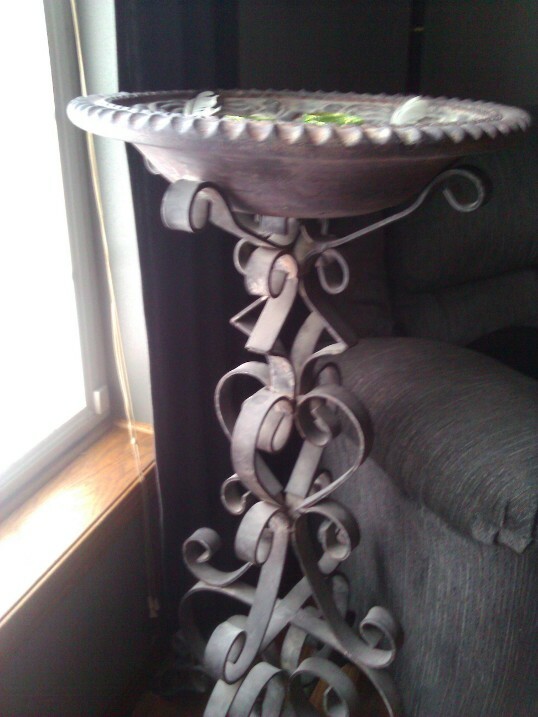 The iron birdbath is also something I’ve had for years when I saw it and just had to have it. A birdbath that has never spent a single moment outside. It’s very heavy and takes up a bit of space that could be put to more practical use, but I just could never bring myself to put it in the yard. A large figurine of a dove used to sit on its rim until Hmandu, my teenaged Cat, sent it airborne to the floor where it smashed into countable but non-repairable pieces. 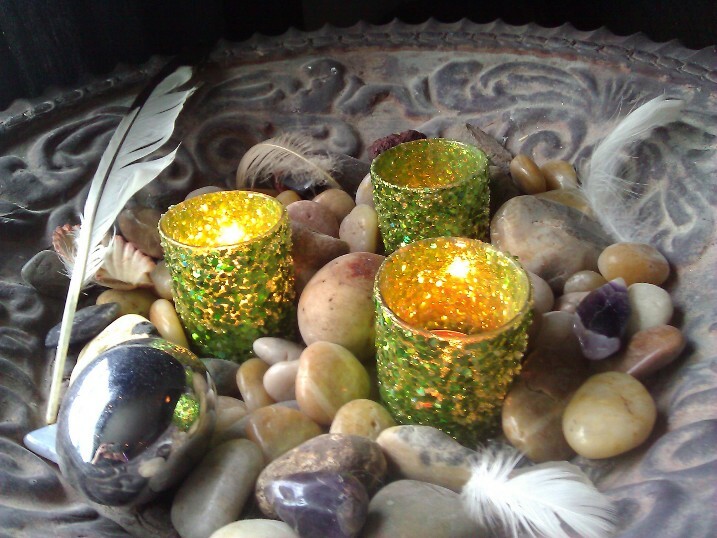 I thought about trying to find another bird to put there, but its layer of stones and 3 votive candle cups gave me an idea. I added some crystals and stones with various properties, some feathers I had collected from outside, and some shells I had picked up years earlier from a coastal beach trip. I have items that correspond to Earth, Air, Fire and Water in the basin that I take the time to hold and feel their energy. This is particularly nice after a long stress filled day at work. Go on, get out there. No excuses. If I can freeze my tail going out to pick flowers you can venture forth to pick up a few pine cones, feathers, or stones or bring in some twigs and decorate them with tiny lights. A transplanted layer of moss can carpet a terrarium or a vessel of beach sand can have you feeling the surf as you tip it from side to side. Let their energy flow as you mindfully blend these gifts of Nature into your Magickal space.